Place fish fillets in a bowl, sprinkle with salt, turmeric, cumin, black pepper and garlic, tossing to coat well. Cover and marinate for 20 minutes at room temperature or longer in the refrigerator. Preheat oven to 400�F. Coat the bottom of baking dish with the oil. Place the fish in a single layer and pour the marinade over it. Bake uncovered for 20-25 minutes. The fish should be firm to the touch. Fish is done when it easily flakes with a fork. Sprinkle with lemon juice. Per serving: calories 106, fat 2.0g, 17% calories from fat, cholesterol 49mg, protein 20.3g, carbohydrates 0.7g, fiber 0.1g, sodium 328mg. In a stainless steel bowl or plastic resealable bag, combine first 6 ingredients. Add the tuna and let marinate for 20 minutes. Broil or grill the tuna 6 inches from the heat source for 4-5 minutes per side. Cook until done as desired (some people prefer their tuna more rare than others do). Per serving: calories 221, fat 10.7g, 45% calories from fat, cholesterol 43mg, protein 27.3g, carbohydrates 2.4g, fiber 0.2g, sodium 354mg. Preheat oven to 350�F. Lightly grease 9x12" ovenproof glass baking dish. Season fillets with salt and pepper. Place fillets in baking dish. Melt butter in a large skillet over medium-low heat. Add the chopped onion and stir until tender, about 5 minutes. Add the remaining ingredients and mix well. Spread the topping over the fillets. Bake until the fish is opaque and flakes easily. The topping should be lightly golden brown 20 to 25 minutes. Serve immediately. Cook's Note: Catfish is a mild fish that tastes a lot like flounder or sole. It has a medium-firm, flaky texture, but holds up well when prepared. Select fillets that are moist and firm with a fresh, mild aroma. 1 lb Catfish nuggets 1 package of Shrimp & Seafood bakeable coating mix 1 egg beaten..
Preheat oven to 375'F. Dip catfish nuggets in beaten egg. Drain off excess. Roll nuggets in the Shrimp & Seafood bakeable coating mix to cover evenly. Bake on foil lined baking sheet 15-20 minutes or until the fish flakes easily with a fork. Pour portions of each of the marinades into separate bowls for dipping. 2 Salmon steaks or fillets (approx. 1" thick) 3 tablespoons butter, melted 1 teaspoon Worcestershire sauce 1 teaspoon onion juice 1/4 teaspoon paprika Place salmon in baking pan lined with heavy duty foil*. Blend butter, Worcestershire sauce, onion juice, and paprika; pour over fillets, covering completely. Sprinkle with salt. 2 tablespoons butter, melted Wash and dry fish fillets. Melt butter in saut� pan. Sprinkle 1/2 teaspoon garlic salt and 1 teaspoon parsley over melted butter; add fish fillets. Sprinkle fish with remaining 1/2 teaspoon garlic salt and 1 teaspoon parsley. When fish fillets become white half way through, turn fillets over. 1. Preheat the oven to 400�F. Place margarine in a 13x9-inch baking pan and put in the oven to melt while oven is heating. Remove pan from the oven. 2. Mix Parmesan cheese, cornmeal, flour, pepper and paprika in a plastic bag. Add catfish fillets, one at a time, and shake to coat with the Parmesan mixture. Arrange fillets in a single layer in the prepared pan, turning once to coat with margarine. Sprinkle remaining cheese mixture over fish. 3. Bake for 10 to 15 minutes or until golden brown and fish flakes easily when tested with a fork. 1. To prepare the chutney, place pineapple, apple, red pepper, sugar, vinegar, onion, curry powder, and mustard seed in a small saucepan and bring to a boil. Reduce the heat and simmer, stirring, for 5 minutes. Remove from the heat and set aside. 2. To prepare the catfish, preheat the oven to 450 �F. Spray a sheet pan with no-stick cooking spray. 3. Sprinkle catfish with lemon juice. Place milk in a shallow dish. Spread corn flake crumbs in another shallow dish or on a piece of wax paper. Dip fillets in milk, then roll in corn flake crumbs. Arrange fillets in prepared pan; drizzle with oil. Bake 8 to 10 minutes or until fish flakes easily when tested with a fork. Garnish with chutney and serve. 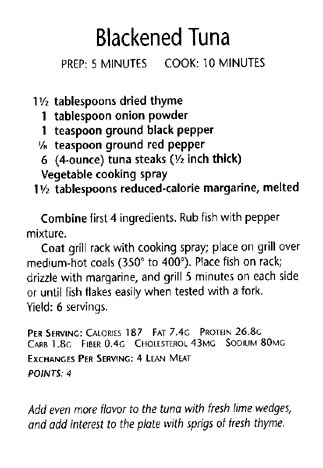 Combine all ingredients except tuna in a medium mixing bowl. Place tuna in sauce mixture. Marinate for 2-3 hours. 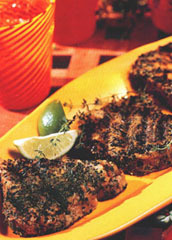 Grill tuna over medium coals for 10 minutes or until cooked throughout, turning once. Fennel is well known in French and Italian cuisines, and is becoming more widely appreciated in the United States as our culinary palates become more sophisticated. Available in the fall and winter months, fennel has a rounded pale green bulb, long stalks (which are often trimmed away) and feathery green leaves. The texture is similar to celery but the flavor is a world apart. The mild sweet flavor resembles licorice or anise and in fact fennel is often labeled anise at many markets. Fennel goes well with fish in particular, which is the inspiration for todays recipe. Rinse the fennel under cold water. Remove and chop the leaves. Cut the fennel into quarters. Remove the core and slice into 1/2 inch pieces. Coat a large non-stick skillet with vegetable cooking spray . Heat over medium-high heat for a 2 minutes. Add the shallots, garlic and fennel. Cook for about 5 minutes. stirring occasionally. Add the fish stock, wine, lemon juice, and fennel seeds. Bring to a boil, cover, reduce heat and simmer for about 5 minutes. Move the fennel mixture to the sides of the skillet and place the halibut in the center. Cover and simmer over medium-high heat for about 10 minutes or until the halibut is cooked through. Cut the halibut steaks in half and place on individual dinner plates. Spoon some of the fennel mixture on the halibut and garnish with fennel leaves. Makes 4 servings. Flake salmon with a fork. Whip egg beaters & add to salmon. Stir in cracker crumbs & mix well. Form into patties. Spray a non stick skillet with cooking spray. Place patties into prepared skillet. Brown on each side (turn only one time). Fish Fillets Once you try fish fillets from the microwave, you'll be hooked for life. 1 lb. fish fillets (sole, flounder, perch, or any mild white fish) Salt and pepper to taste 2 tablespoons butter or margarine 1/2 cup grated Parmesan cheese 1/2 cup mayonnaise 1 tablespoon Gravy Master 1 tablespoon lemon juice 2 tablespoons scallions Directions: Arrange fish fillets in a shallow baking dish. Sprinkle with salt and pepper and dot with butter. Cover loosely with waxed paper and cook on HIGH 2 minutes. Combine Parmesan cheese, mayonnaise, Gravy Master, lemon juice and scallions. Spread mixture over fish. Cover loosely with waxed paper and cook on HIGH 1 or 2 minutes or until fish flakes easily with a fork. Do not overcook! Makes 3 to 4 servings.